"Col. Harvey has gone back on an agreement made with me months ago." New York Times, January 11, 1902 advertisement by Robert G. Newbegin stating "The only way to obtain Mark Twain's BEST books is to buy the Complete Set" was a direct response to Harper's advertising campaign for their Library Edition advertised in sets of six titles as Mark Twain's BEST books. In October 1901 Harper and Brothers, under the new management of George Harvey, was issuing two series for several of Mark Twain's titles in uniform style -- the series with red cloth binding featuring gold cornstalks around a MT monogram and the Harper's Library Edition featuring maroon cloth with a gold and green ornamental flourish on the spine. American Publishing Company, in an alliance with Robert G. Newbegin, issued two additional uniform editions of 22 volumes called the Underwood and Riverdale editions. Contractual agreements with Harper and Brothers had spelled out how American Publishing Company would be allowed to use the Harper Mark Twain titles. Newbegin's name was never mentioned in any of the contracts nor were any restrictions made on how American Publishing Company would be allowed to distribute the editions. Tensions between the two publishing houses continued to rise as advertising campaigns heated up. Ads with Newbegin's name urged book buyers to purchase complete sets and Harper advertised that they controlled the "best" titles. 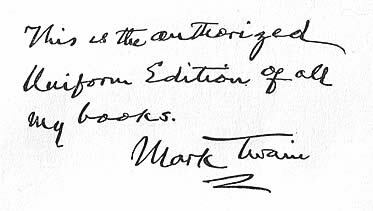 A flyleaf bound inside both the Underwood and Riverdale editions issued in 1901 featured a handwritten statement by Mark Twain stating the American Publishing Company's edition was the "authorized Uniform Edition of all my books." This statement first appeared in the 1901 Underwood and Riverdale editions issued by American Publishing Company for Robert G. Newbegin Company. I shall be glad if in offering the Collected Edition of my books to the public you will claim for it on my part only this and no more: that I have prepared it with care and that it is the only complete collection of my books that has been made. Any books which I may yet write will be added to it. P. S. I am sorry if your canvassers complain of it as a hardship that the Harpers advertise 9 of my books under the heading "Mark Twain's Best Books" but what would they have me do? I think one must concede that the Harpers are within their rights; for they do not claim that I, or the public, or the critics, have set the verdict of "best" upon those 9 books. It is merely their own judgment that the 9 are my best. I do not quite agree with them, but in a matter of taste every man is entitled to his own opinion. I rate 6 of their 9 as being among my best books, but you have the whole of their books in your list, and in addition you have seven which I rate above any that are in the Harper list, with the exception of 4, viz., Huckleberry Finn, Yankee at the Court of King Arthur, The Prince and Pauper, and Personal Recollections of Joan of Arc. If you, in the exercise of your own rightful and independent judgment, should advertise your whole list (of 22 books) as being my "best," I should not complain. I should only feel flattered and happy in the reflection that there was at least one man of better taste than my own in the world. MARK TWAIN (The Autograph, p. 70). Newbegin later used some of the text of the letter in his advertising campaigns to sell the edition. Blliss's check for the past half-year is just received -- nearly $6,000. Eight or nine thousand still owing, but not due yet, because it isn't yet due from Newbegin (Leary, p. 465). Newbegin's backer, Mr. Underwood, has asked me to give a circular letter for canvassers' use, to modify Harper's big advertisement of "Mark Twain's Best Books," and I feel pretty willing, for in using that heading Col. Harvey has gone back on an agreement made with me months ago. He was going to use a heading "Mark Twain's Choicest Books," and I protested. If you approve the circular, please mail it to Mr. Underwood, for he is uneasy; and the Newbegin business is large, the Harpers' trifling. Their July statement for past 6 months foots up $2000 -- and I get it next November (Leary, p. 465). [T]he Harpers don't say I call theirs the latest and best -- they say it themselves. Therefore why doesn't Newbegin say the very same thing? Harper has set the example, and could not complain (Leary, p. 466). It is likely that Rogers passed along Clemens's letter to Mr. F. L. Underwood -- Frank Livingston Underwood. It is even more likely that Underwood and Rogers had known each other through their past business dealings. Underwood was the first president of Arizona Copper Company. At the time of his death at age 73 in 1915, he was President of the British Columbia Copper Company. He and Rogers were two of the original organizers behind the American Smelting and Refining Company. Underwood had started his career as a bank clerk in Muscatine, Iowa, organized the Merchants' National Bank of Kansas City, Missouri and been involved in building Western railroads. How Underwood came to be involved in backing Newbegin's Underwood edition -- an edition which bore his name -- is an unanswered question. It seems likely that Rogers could have steered Underwood into such an investment and even more likely that Rogers himself may have been involved in quietly assisting Clemens in other financial ways as well. Not only was Newbegin soliciting endorsements from Clemens, he was also offering "free of cost, six of Mark Twain's Best Books" in exchange for endorsements from "representative men" for his own Complete Uniform Edition. One such solicitation from Newbegin dated October 1, 1901 to businessman Bloomfield Brower stated that Newbegin was soon to issue the "Complete Uniform Edition" of Mark Twain's works and he would treat any endorsements in exchange for six of "Mark Twain's Best Books" as confidential. (Newbegin to Brower, October 1, 1901, MTP). Apparently Newbegin was giving away Harper's set of six titles as small bargaining chips to obtaining advertising puffs for his own editions of 22 volumes. In spite of the endorsements Clemens personally wrote for Newbegin and Underwood it was only a matter of time before phony letters with Clemens's signature surfaced asking buyers to buy his books. This is a mighty cold-blooded piece of rascality. The Newbegin Co wanted me to give them something just about like this, (they applied first through Bliss and he brought me the draft of it) but of course I didn't consent. But I sent them something through you (which you approved) and never got even a thank-you. I didn't suit, I guess. So now they resort to plain forgery. They forge my signature, and then they put into my mouth a shameless personal letter no word of which ever had its source in either my mouth or my head, and then they add sacrilege to impudence and counterfeit my style! Now then, am I not right? Sue these rascals at once (Leary, p. 472). Attorney Thomas B. Reed, a close friend of both Henry Rogers and Clemens initiated the case. Robert Newbegin was confronted with the fraud and laid the blame on another book dealer. Newbegin explained to Clemens in a letter of October 7, 1901 that he had sold 500 sets of "the Popular edition" to W. I. Squire (Washington Irving Squire - b. 25 Oct. 1844), a book dealer in Chicago. Newbegin blamed Squire for printing and mailing out the letters featuring a fraudulent signature. Newbegin claimed he had informed Squire that his firm would not be a party to such sales tactics and he felt the practice had been discontinued. The suit against Squire was dropped, however, when Squire died two days later on October 9, 1901 in Toledo, Ohio. On November 19, 1901 Newbegin ran the following ad which covered four columns in the New York Sun. New York Sun, November 17, 1901, p. 7. Newbegin's ad reprinted the handwritten letter Clemens had sent him that summer. The ad also acknowledged that four-fifths of the uniform edition sets had been sold by private subscription but his offer was a departure from that plan. The ad did not specify which edition Newbegin was selling directly to the public. "Wally" Bliss was here yesterday, and I guess there are going to be some developments. I have kept out of the Harpers-Newbegin fight up till now, but I believe the time has come to take a side in it. So I will drop in on you and get your advice before I do anything in the matter (Leary, p. 478). One of the last newspaper ads from Newbegin appeared in the New York Times on March 29, 1902 under the name of his new partnership with Anglo-American Publishing Company. New York Times, March 29, 1902, p. BR19. The Anglo-American Publishing Company was incorporated in New York in October 1901 with $100,000 capital. Directors of the company were listed by the New York Times on October 30, 1901 as Guy Stonestreet, Robert F. Stonestreet and Herbert Schubert. For a short while Anglo-American Publishing Company also published a periodical called Anglo-American Magazine. The July 1902 edition featured an ad for Mark Twain's uniform editions with instructions to customers to contact the company for further details. The inventory of uniform editions distributed by Newbegin appears to have been depleted after the summer of 1902 as evidence of further advertising campaigns is lacking. However, the tensions created by the sales competitions between publishers and distributors helped set the stage for Henry Rogers to negotiate a settlement that would concentrate all rights to Mark Twain's works in the hands of only one publisher. Ancestry.com - for biographical information on Washington Irving Squire. "Barton Sewell Dies. President of Copper Co. Succumbs After Long Illness, Aged 67." New York Times, 8 January 1915, p. 11. "Frank L. Underwood Dies." New York Times, March 18, 1918, p. 13. "Mark Twain's 'Best Books,'" The Autograph, March-April 1912, p. 70. Online via google books. Newbegin, Robert G. to Bloomfield Brower, 1 October 1901. MTP. Newbegin, Robert G. to Samuel Clemens, 7 October 1901. MTP. "New York Incorporations," New York Times, 30 October 1901, p. 13.